Just because you're a loyal fan doesn't mean that your football gear has to consist of over-sized jersey's and slouchy sweatpants. To get you Superbowl ready for Sunday I put together 2 outfits that's chic enough to set you apart from just one of the boys. Who are you rooting for this Super Bowl? 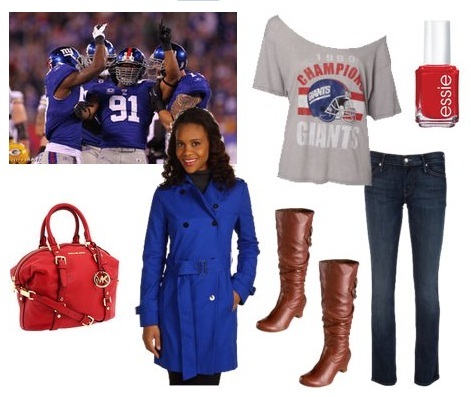 love these actually FASHIONABLE ideas for super bowl garb! I'm a Redskins fan--thankless I know. But I will cheer for the Giants this weekend. Thanks for sharing on Monday Mingle over at Momtrends! That Giants tee is too cute!